Happy Thirsty Thursday! I am so excited to share this absolutely amazing punch with you in a groundbreaking way. You will have noticed that over the last 9 months I have really been transferring my recipes over to video, but we are really shaking things up with this video which will give you a virtual reality experience!! If by any chance you have virtual reality goggles at home (even the cheap kind that lots of people have gotten for their kids) it is a pretty awesome experience- you can see all around my kitchen while I cook. But even if you don’t have those, you can still enjoy a really cool 180 experience, which you can control with your mouse- come take a look! To get the full effect of VR videos, we recommend watching on a Daydream View (on a supported phone), Google Cardboard, or a PlayStation VR. If you’re using one of these devices, make sure you have the most recent version of the YouTube app. If you don’t have a VR viewer, you can still watch this content on your mobile device or desktop in Chrome, Opera, or Firefox. It will appear as a 360 video without 3D. Any now, a little something about this awesome crazy cocktail punch which I made with warm weather and upcoming Mother’s Day festivities in mind! I feel like this is really easy to make and you wind up with a ton of bang for your buck, literally and figuratively. Like you can make this in 10 minutes and make so many people ooh and ahh over it, it’s totally delicious and everyone can serve themselves! It’s kind of the most ideal scenario for entertaining, right? 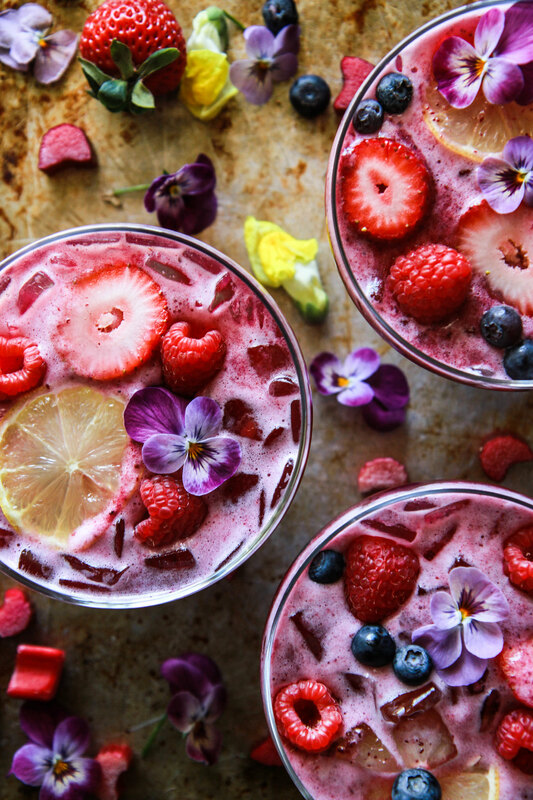 While I definitely added a generous amount of vodka to the mix, you could certainly make this without booze and it is perfect for kids, a shower or any festive occasion where you want a non-alcoholic beverage. WHAT DID YOU THINK? Was this cool to you? I was so lucky to get to partner with an amazing company like Pixvana as we tested this out, and I am so excited that we have more projects in the works- but let me know what you think about this experience! Do you want to see more like this?? My kids are itching to get on this action, and I know that even Wilbur makes an appearance or two in this video with his wagging tail if you are looking off to the side! In a saucepan, combine the berries and rhubarb with the sugar and water and bring to a simmer over medium heat, cooking until all of the sugar has dissolved and the berries and rhubarb have softened. Puree on high until smooth. 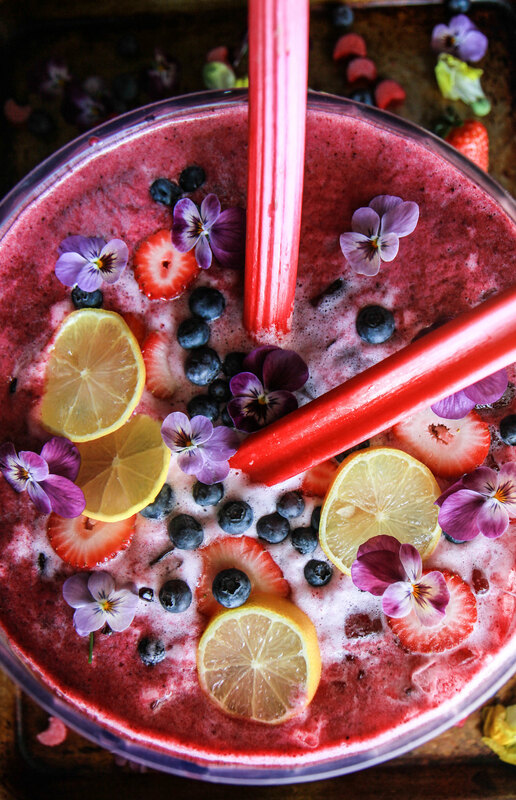 Fill a punch bowl with ice and add the berry rhubarb syrup. Follow with the fresh lemon juice, vodka and coconut water. 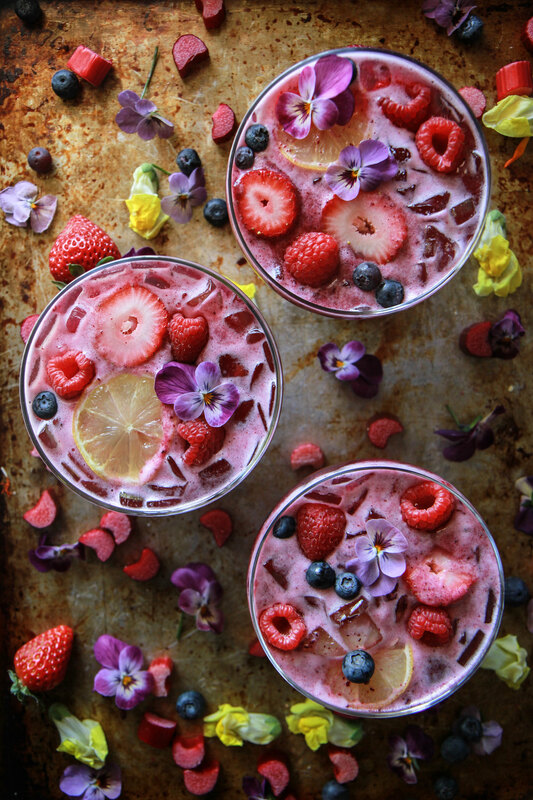 Garnish with 1 cup of fresh berries, lemon slices and edible flowers if desired. Can’t get the video to run on my phone. I’m never in one spot to watch it on another device. It looks fantastic! Hi Leslie! you can check it out on facebook or on youtube and it should work on your phone! SO epic. Wish we could have a glass together! And that video is the way of the future! Love it. The Video is so much fun! And this drink is epic..
Is it possible for a drink to be TOO pretty to drink?! Wow, this is really beautiful. Love the colors.